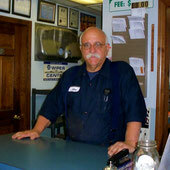 Rochester Radiator and has been serving customers at the 86 Washington Street location since 1979. We offer professional and reliable car repair service including written estimates and excellent warranties. We have many loyal, long-term customers and we are committed to 100 percent customer satisfaction. See reviews by our customers on our Facebook page -- most have given us five out of five stars. Try us once and see why we have so many loyal, satisfied customers. Our technicians are ASE Certified. Click the logo to the left to learn more about what it means to be ASE Certified. The National Institute for Automotive Service Excellence (ASE) is a non-profit, independent organization dedicated to improving the quality of automotive service and repair through the voluntary testing and certification of automotive technicians. We are conscious of environmental issues and dispose of our waste oil, anti-freeze and other materials in a responsible manner. We comply with recommendations on used oil management standards from the U.S. Environmental Protection Agency. Radiator, Cooling System, A/C Specialists!